Q: How often must I wear my aligners? A: You must wear your aligners for up to 22 hours daily. You may remove them for eating, drinking and regular oral hygiene. Q: Are there any restrictions to what I can eat while in treatment? A: No. Unlike braces, you may eat whatever you like as long as you remove the aligners before eating. Prior to placing the aligners back on, it is important to brush your teeth and the aligners after you eat. 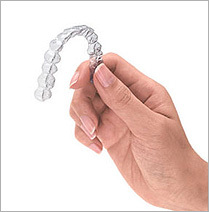 Q: Will wearing the aligners affect my speech? A: Like any orthodontic treatment, there is a short adjustment period. The more you speak with the aligners on, the quicker you will adjust. Q: Is there any discomfort with Invisalign® treatment? A: There will be some pressure and minor discomfort for a day or two after each initial insertion. This is a sign that your teeth are moving sequentially into their final position. Q: Can I chew gum? A: It is recommended that you remove your aligners prior to chewing gum as the gum will stick to the aligners. Q: Can I smoke with the aligners in? A: We discourage smoking with aligners as the cigarette smoke will tend to discolor them. Q: How do I keep my aligners clean? A: Brushing them with toothpaste will keep them fresh and clean. Q: How often do I see an orthodontist while wearing Invisalign®? A: Regular office visits are every five to six weeks. 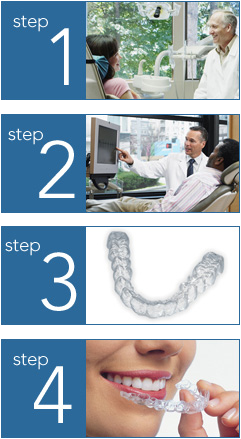 This will ensure that your Invisalign treatment is progressing as planned. Q: What happens after my treatment is complete? Do I need retainers? A: All orthodontic patients are instructed to wear their retainers at night indefinitely. Sleeping with your retainers in at night will ensure a healthy bite and maintain the new position of your teeth. A: Treatment time varies depending on the severity of the misaligned teeth. Treatment time can be shorter than traditional braces, between six and 18 months. Q: Does Invisalign work for kids? A: Yes, if their teeth, including second molars, have grown in completely.